Rethinking the high school experience. That is what XQ America is about: reshaping, rethinking and reimagining high schools. Tiger Ventures, with a grant from XQ, is a high school that is doing just that. 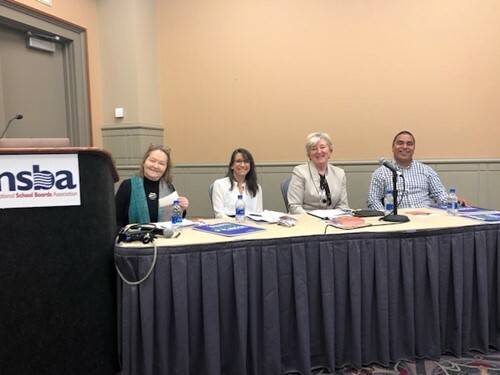 It was the basis of a recent presentation that involved Superintendent Dr. Suzanne McLeod when she and other XQ educators represented XQ America at the National School Boards Association (NSBA) Annual Conference in Philadelphia. Their presentation, “High School Transformation…That’s a School Board Thing,” focused on the role school boards and superintendents play in rethinking how teaching takes place, and on efforts to demystify the work of local school boards so as to encourage greater involvement. U-E is proud to be a part of the XQ team, working to rethink high school, working to build community partnerships, and working to prepare our Tigers for successful futures.